- ★Voice Control★: Works with Amazon Alexa (Echo and Echo Dot), Google Assistant and IFTTT via voice control. Samsung SmartThings and NEST compatibility will be supported soon. 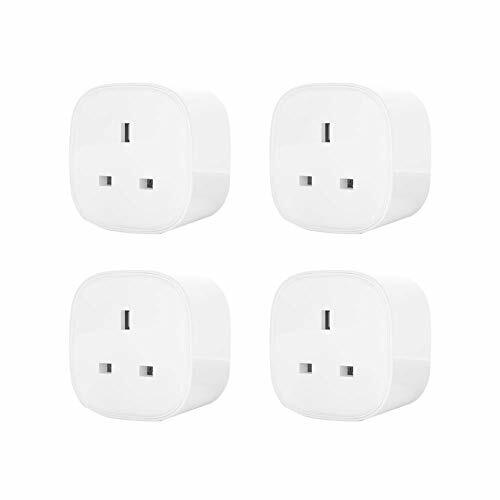 - ★Remote Control★: Control devices connected to the smart plug wherever you have Wi-Fi using the free Meross app on your smart phone (iOS 9 or higher, Android 4.1 or higher). Note: Our self-developed APP----Universal for most electrical appliances such as fan, water dispenser, water heater, electric pots, TV, humidifier, light, holiday decorations and etc. - ★Timing Function★: Schedule the Smart Plug to automatically power electronics on and off routine as needed. E.g: Setting lights to come on at sunset or turn off at sunrise. You can create a group for all of your smart devices and control them all with just one command. Simply set a timer for the Smart Plug to turn off its appliance automatically. - ★No Hub Required★: Works with almost any Wi-Fi router without the need for a separate hub or paid subscription service. - ★Technical Aftersales★: If you encounter any product issue or need further support, please feel free to contact us through E-mail or Amazon directly, we offer free replacement service anytime for any realiable reason if the plug is defective. For our contact info, you can ask a question on the WiFiExpert storefront page.